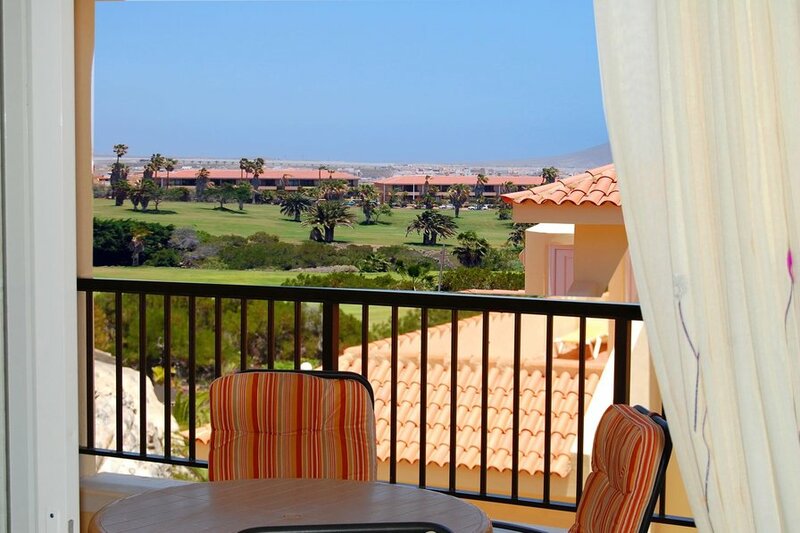 This very comfortable 1 bed apartment to rent in the immaculate complex Ocean Golf and Country Club in Golf Del Sur has wonderful views. This very comfortable 1 bed apartment has lovely views to the sea and into the golf course. The complex of Ocean Golf and Country Club is seen as one of the nicest in the area. It is immaculately kept and enjoys 2 adults pools (1 heated) and a childrens pool. Being set next to the golf course it is ideal for golfers but the resort has so much more to offer. Many people travel here who want to enjoy the Tenerife climate but don't necessarily want the commercialism and hustle and bustle that comes with some of the bigger resorts. This is a more exclusive area - ideal for couples and families - with some really nice restaurants. At the front of the complex there are some quiet bars and restaurants, and a supermarket. Within a 10 min walk is the resort centre called San Blas where you will find plenty of good quality bars and restaurants - many with entertainment. Here you will also find boutiques, banks, cashpoints, and a doctors. A 10 minute walk in the other direction takes you to the marina with its array of sea front restaurants, bars and shops. Full size Oven & Hob, Fridge, Toaster, microwave, Elec Kettle, Breakfast Bar, Satellite TV with FULL English TV (BBC, ITV, CH4 and SKY). 10 minutes from Airport, 15 minutes to Los Cristianos and Playa de Las Americas (by car). This apartment is looked after by a Local Management company who are close by should you need them. They also offer a very popular taxi meet and greet service to meet you off the plane and transfer you to the apartment.